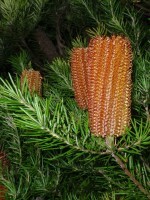 A large group of hybrids with pendent, bell-shaped, 4-8 cm long flowers during most of the year in colours ranging from white to pink, yellow and orange to red. Attracts nectar-seeking birds. Lobed, toothed, mid green, maple-like leaves up to 15 cm long. Fast growing in suitable conditions. Prefers a sheltered position in well-draining soil with even moisture levels and full sun or partial shade. In hot climates, protect Abutilon x hybridum from afternoon sun to prevent stress due to wilting of the leaves. Can handle some wind exposure, but since the stems are relatively weak, staking is required when there is insufficient shelter. Pinch out the tips of young plants to encourage branching and subsequently prune regularly to keep compact. Tolerates light to moderate frosts. Easy to propagate from cuttings. Elegant shrub with pretty flowers. The leaves with a lovely shade of green lend themselves perfectly as a backdrop for other, smaller plants in borders. Suitable as an indoor pot plant as long as it receives sufficient light. Slow growing bushy shrub with shiny, leathery, toothed leaves, 6 to 12 cm long, heavily spotted and blotched with yellow. Aucuba japonica 'Crotonifolia' is dioecious, meaning it has separate male and female plants. The flowers are tiny and insignificant, chocolate brown to purplish, .5 cm across. On female plants, the flowers are followed after pollination by bright red, 1 cm wide berries. Foliage and berries are harmful when ingested. Thrives in shade or partial shade. Leaves may get scorched in full sun. Requires well-draining soil, and does not cope with waterlogged conditions. Tolerates air pollution. Usually has a compact growth habit, but can be pruned to shape. Withstands drought, although growth is more luxuriant with regular moisture supply. Wonderful foliage plant to lighten up a dark area, or to give your garden a lush, tropical feel. Also looks good as a hedge for year-round interest. If you like to see berries on your shrub, make sure to select a male plant for pollination and a female plant for fruit production. One male plant is sufficient for about eight female plants. Looks lovely in combination with the purple flowers of Liriope muscari, which thrives in similar growing conditions. Evergreen shrub or sometimes a small tree, native to Colombia, Ecuador, and Peru. Large, ovate, felted leaves, often wavy or shallowly lobed,18-25 cm long, smaller on flowering stems. Solitary, pendulous trumpet-shaped flowers, 15-20 cm long, yellowish with scarlet-orange. Unlike the flowers of most other Brugmansia species, which are scented to attract moths for pollination, Brugmansia sanguinea flowers are not fragrant, and in their native habitat are pollinated by hummingbirds. All parts are poisonous. Naturalised in New Zealand. 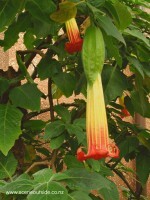 Synonyms: Datura sanguinea, Datura rosei, Datura rubella, Brugmansia bicolor, Brugmansia lutea. Prefers a sheltered position in partial or full shade. In cool climates, a sunny position is fine too. Hot temperatures inhibit flowering. Difficult to propagate from vertical cuttings, but can be propagated from horizontal stem sections or layering. Tolerates light to medium frosts. May be damaged by moderate frosts, but generally survives. Specimen shrub with a tropical appearance and beautiful flowers for most of the year. Evergreen shrub with purple tubular flowers 2-3 cm long in terminal panicles on long, arching branches. Ovate to lance-shaped leaves, 10-15 cm long, to 3 cm wide. Cross between Cestrum elegans and Cestrum parqui. All parts are poisonous. Hardy to -7oC. Cestrum x cultum may be cut back after flowering to near ground level and will re-grow during the next season to a height of about 2m. 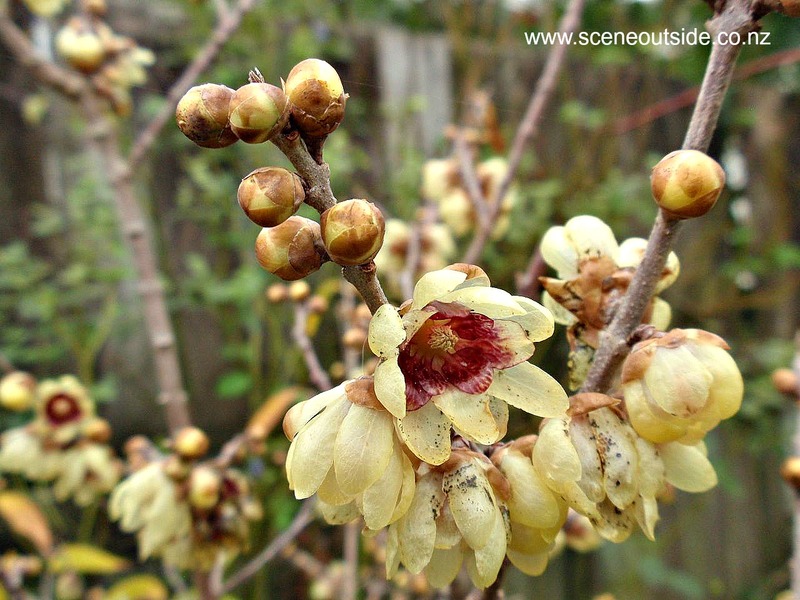 Evergreen shrub, flowering in spring and summer with deep pink, crepe paper like, 5 cm wide flowers with yellow central stamens and a maroon blotch at the base of each petal. Sticky brown stems and narrow green leaves in opposite pairs. Prefers a sunny spot in light, well-draining soil. Tolerates clay. Cistus x purpureus 'Brilliancy' tends to form quite an open shrub, and needs trimming after flowering to keep it compact. No need for fertilisers. Drought-tolerant once established. Suitable for coastal gardens and exposed sites. Frost hardy (zones 7-10). All Cistus species thrive in Mediterranean climate types. Individual flowers only last one day, but the plant is generally smothered with flowers in particular at the beginning of the flowering season and puts on a fantastic show. Evergreen shrub, endemic to New Zealand, but rare in the wild. The pinnately compound, 15-25 cm long leaves resemble those of another New Zealand native plant, the kowhai (Sophora species). Drooping, 8 cm long, red flowers, shaped somewhat like the New Zealand native parrot's (kaka's) beak. May flower at any time during the year, but most specimens flower during spring or summer. The photo was taken in early spring. Green, pea-like seed pods. Clianthus maximus is similar to Clianthus puniceus, and for a long time was treated as a variety of the latter. Also sold as Clianthus 'Kaka King'. Compared to Clianthus puniceus, Clianthus maximus has larger flowers and leaves, and its foliage is glossy and darker green. Prefers an open sunny position in well-draining, fertile soil. Not tolerant of very wet, waterlogged conditions, but tolerates dry soils once established. When growing conditions are not ideal, Clianthus maximus is susceptible to a range of pests, including caterpillars, slugs, snails, leaf miners and thrips. The shrub tends to have an open habit, in particular when not grown in full fun, so prune regularly to keep the plant compact. Tolerates light to medium frosts. Suitable for coastal gardens and exposed sites. Can be short-lived, and may need to be replaced after 3-5 years. Easy to propagate from cuttings or seed. 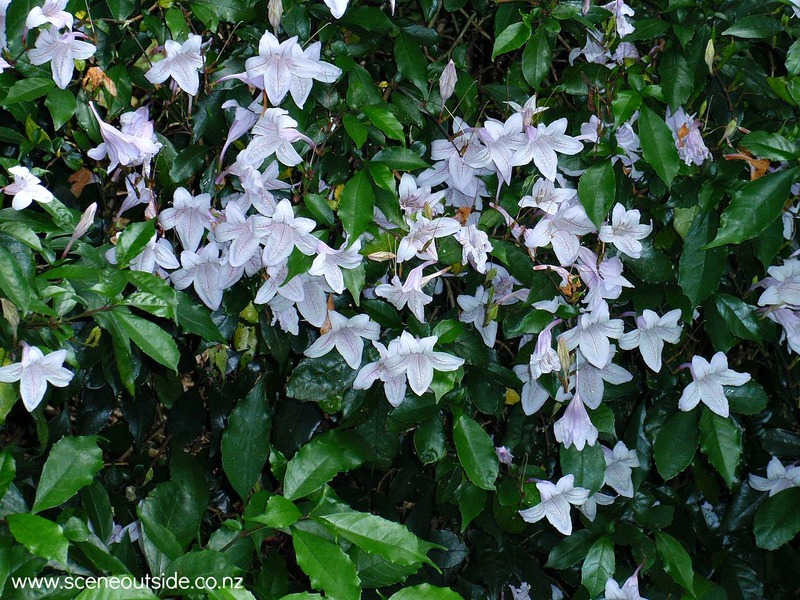 Attractive, fast growing, New Zealand native plant with gorgeous flowers in large clusters. Can be trained as a climber or espaliered. Variable evergreen shrub or tree to 4-6 m tall, with oblong, thick, very shiny leaves. Leaf size varies from 6-9 cm long and 4-7 cm wide in shade to 2-3 cm long and 1.5-2 cm wide in full sun. Leaf margins may be wavy or somewhat curled under. Like many coprosma species, the leaves have small pits (domatia) between the midvein and one or more lateral veins of the undersides. Inconspicuous female and male flowers on separate plants. On female plants, flowers are followed by bird-attracting orange-red drupes. Occurs naturally throughout the North Island and parts of the South Island of New Zealand. Has give rise to a number of variegated cultivars. Extremely tough plant, tolerant of very exposed coastal situations where it may become prostrate or assume gnarled and twisted shapes. Prefers full sun, but tolerates partial shade well. Copes with deep shade, but is more stretched and less compact. Intolerant of wet or waterlogged soil. Suitable for dry areas. Tolerates light frosts. Responds well to clipping and is often used as a hedge, in particular in coastal areas.